Henley Honda | Honda Canada | CR-V Named Motor Trend SUV of the Year! CR-V Named Motor Trend SUV of the Year! We’re at it again! The Honda CR-V has won the Motor Trend Sport/Utility vehicle of the year for 2015, beating out 18 other vehicles to clam this prestigious title! 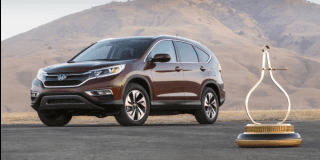 With a huge list of vehicle improvements in this 2015 model, it is no surprise that the CR-V was chosen for this award. It’s greatly improved fuel economy and driving dynamics such as driver-assistive technologies definitely helped push the CR-V to the next level in 2015. Motor Trend’s editor-in-chief noted this when he said; “The 2015 Honda CR-V impressed our judges with its extensive list of delightful design and thoughtful engineering improvements. Our editors were especially impressed by Honda’s responsive and efficient continuously-variable transmission and sophisticated safety systems – particularly the smart and seamlessly integrated Lane Keeping Assist system. Efficient, practical, and a joy to drive; the 2015 Honda CR-V does virtually everything well.” Not bad praise if we can say so ourselves! Come into Henley Honda today to see why the CR-V took home this award. One test drive and you will be hooked too!